When designing your landscape project, it is important to maintain a wide variety of textures, colors, sizes and shapes in both your hardscape and softscape material. This creates a well-planned and eye-catching look that maintains interest. In the picture above, we have chosen to incorporate neutral toned brick pavers for the walkway and steps, with a mix of natural stone for accent pieces and additional stepping stones. The chosen plant material consists of a wide variety of textures, heights, shapes and colors with various blooming seasons. This creates a sense of fullness, warmth and diversity in the surrounding flower beds. To get the most out of your landscape project, it is important to consult with a professional landscape designer. Give us a call today, and schedule your free consultation! Increase Curb Appeal With A Brick Driveway! Homeowners love finding ways to increase their curb appeal, whether they’re getting ready to sell their home or for their own enjoyment! With your driveway being such a large space, it has a big impact on your home’s curb appeal, and the driveway material you choose should not be an afterthought! A beautiful brick driveway that coordinates with the exterior of your home and the rest of your landscape is a great choice. It is versatile, coming in many different styles, colors, shapes and sizes! It is durable and can withstand the weight of multiple vehicles! If permeable brick pavers are used, it can even solve standing water issues as the rain water drains through the brick joints and into the ground below! Want to learn more about the different options available to you? Give us a call today and we’ll schedule you a free consultation! When choosing your hardscape material, it is important to keep your home’s existing stonework in mind. While an exact match would be overdone, a choice within the same color and texture family creates fluidity between the home and landscape. For example, a natural stone path and set of steps compliments the stone walls of the home pictured here. Working with professionals in the industry is the best way to ensure proper material selection for your hardscape projects. Call us today for a free consultation and see what materials are available for you! Boost Curb Appeal With A Friendly Transformation! Wanting to boost curb appeal? Consider adding a seating area to your front walkway. This is a great solution for homes without porches! A retaining wall can be added to create a beautiful border for the space. At the right height, a retaining wall can double as a seating wall when extra company is around! Add some landscape lighting to this feature and your home will be transformed! Call us today for a free consultation to discuss the options for you! Be Proud Of Your Home! Make a great first impression with an updated driveway and front entrance! Updating any hardscape work, along with landscaping, has a huge impact on the curb appeal of your home. Whether you’re wanting to create something you can be proud to come home to, or you’re trying to increase the value of your home, an updated landscape is a wise investment that will go a long way! We can customize a design suited to your needs and budget. Give us a call and start the planning process today! A Quick Update Has A Huge Impact On Curb Appeal! Need a boost in curb appeal? A quick update of plant life may be all you need! Don’t let overgrown shrubs or outdated perennials drag your home’s appeal down! Flipping them out with well chosen modern varieties has a huge impact! Need help with plant placement or selection? Meet with our horticulturist and landscape designer, Carlos Montano, for a free consultation! An Arbor Is A Beautiful Addition To Any Flower Bed! Adding an arbor to a corner in your flower bed is a great decorative way to liven up the space. You can add any type of climbing perennial to the arbor for a beautiful effect! We recommend unique flowering varieties such as climbing roses, climbing hydrangeas or trumpet vines! For more great plant choices, consult with a Horticulturist who is familiar with the temperament, needs, potential diseases and potential pest susceptibility of various plant varieties. A Beautiful Solution For Sloping Elevation! Do you have a major change in elevation on your property? A raised flower bed with a surrounding retaining wall is the perfect solution. This provides beauty, functionality and separation of spaces. The key to a sturdy retaining wall of this height is having it professionally installed. It takes the craftsmanship and skill of trained professionals to build a wall that will last for years to come. Interested in learning more? Call for a free consultation today! Try Creating a Miniature English Garden In Your Flowerbeds! Tired of perfectly manicured flowerbeds? Consider striving for a more “European garden” style instead! The key to this look is variety and quantity. It is important to mix a wide variety of perennials and annuals for diversity. You also want to make sure you fill in all of your spaces for a lush and full appearance. Need help deciding what to plant? Meet with our horticulturist and landscape designer! We will put a unique design together suited to your tastes and needs! 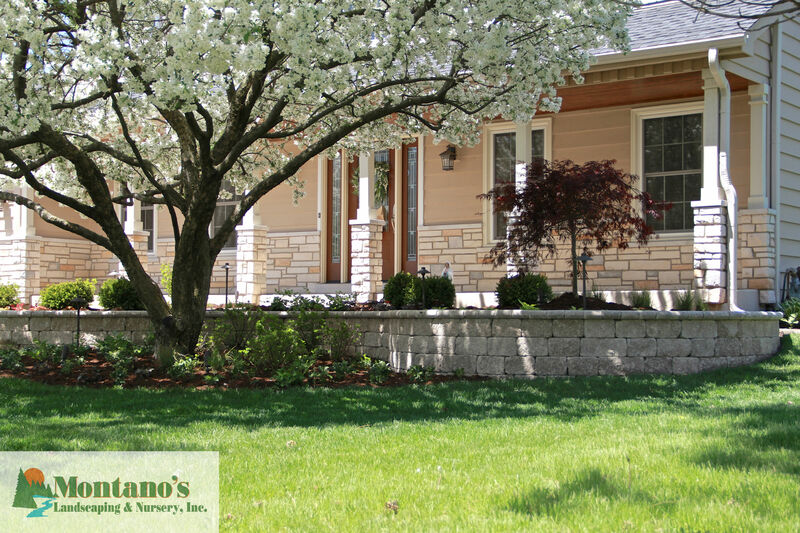 Montano’s Landscaping & Nursery, Inc.
An updated front entrance and landscape has a huge impact on the curb appeal of your home! This makes updating your front landscaping a wise investment! Retaining walls, walkways and well manicured plantings go a long way! Give us a call today and we will schedule you a free consultation!